It really does seem like Pet Parade has set up home in our house at the moment! As you can see from my previous post regarding the Pet Parade Family Scooter Playset, Mini Me is a huge fan of the range. However not only does the range include Pet Parade puppies, but also cats and kittens, expanding the range even further to suit all animal lovers, including the Pet Parade Mummy and Baby Playset. 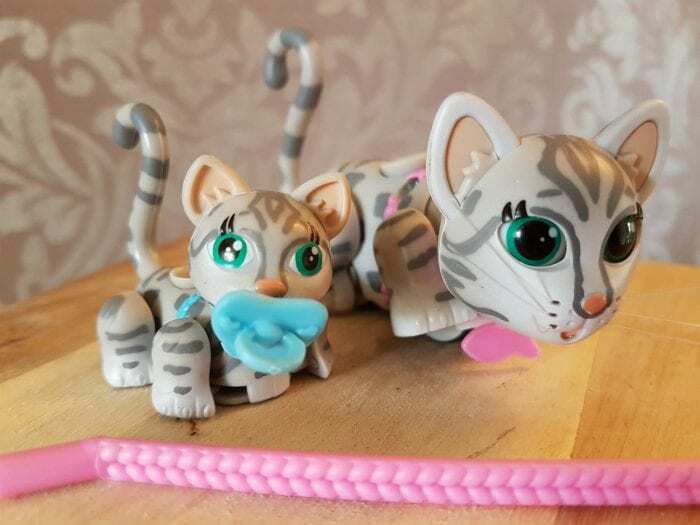 We were recently sent the Pet Parade Family Mummy and Baby set of cats, which is seriously cute and fits well into the range of toys Mini Me already has. The Baby Pet Parade character will follow the Mummy by attaching itself via the use of magnets to the mummy’s tail. The toys do not require batteries and are ready to rock and roll as soon as they are out of the packaging! Featuring realistic movements, simply use the joystick on the backs of the animals to change the direction in which they are moving and also move their heads and eyes. As with all the pets in the Pet Parade range, each pet has a tag around its neck on which you can write a name. The pack includes leads for each pet in which to move them freely around – always great if you have a laminate floor – and also a dummy for the Baby pet in the pack. The Pet Parade Family Mummy and Baby sets from Flair are available in different breeds in both cats and dogs, making them perfect for collecting! I should know, we have quite a few of the range now, but Mini Me was even happier to add some cats to her collection. The Pet Parade range is available in all good toy retailers and is set to be a huge hit for Christmas 2016!